Chipotle is turning to bacon-loaded burrito bowls for some good news. Just as the burrito chain faces yet another major food-borne illness outbreak, some of its locations are now preparing to unleash a series of new menu items and deals that, perhaps ironically, are part of its long, ongoing comeback campaign from a food safety crisis in 2015. On Thursday, Chipotle announced it is testing two new menu items and promotions in select cities across the country as it continues to gradually change up its notoriously limited menu in hopes of improving sales. The big new food Chipotle is betting on? Bacon. That's right, the ever-ubiquitous fast food staple is headed for your burrito bowls (shown below), starting with an eight-restaurant test in Orange County, California this September, and if it's successful there, a full market test and potential national rollout. Along with trying out bacon, the company will expand its first-ever "build your own" nachos test run to all of its locations in Denver and Minneapolis-St. Paul in October, according to a press release. Execs at the chain all but conceded bacon is low-hanging fruit. Meanwhile, Chipotle is unleashing the happy hour-like deal for $2 tacos it first announced earlier this summer. If you buy any drink after 8pm, you can throw in some tacos for two bucks each at some locations in Miami and Dallas. These locations will stay open later -- until 11pm -- to provide ample time to feast on the discounted tacos. 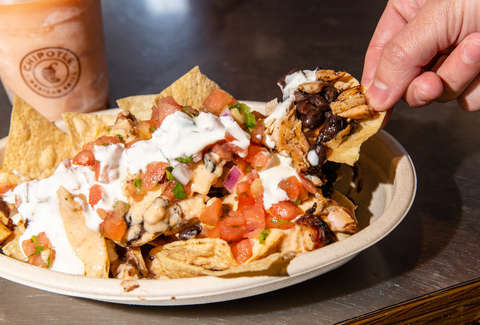 A new deal Chipotle is currently testing in Philadelphia and Indianapolis, however, appears to offer the most upside for your lunch plans: buy an entree -- burrito, burrito bowl, order of tacos, or salad -- and add a soft drink and chips for an extra $3. In other words, it's a combo deal, you know, like most fast food chains. This shouldn't be all that surprising, considering Chipotle's new CEO, Brian Niccol, previously headed up Taco Bell. The changes come just weeks after Chipotle offered a rare glimpse at the future of its menu, including long-requested items like quesadillas and better salads, and are the latest among several moves the chain is making under Niccol as it works to lure people back to its restaurants. Of course, the recent reports that more than 700 people were sickened after eating at Chipotle in Ohio may prove to be a major setback in the company's long recovery from the food-borne illness outbreaks that brought it to its knees in 2015 and 2016.
Business implications aside, the big take away here is that you may soon be able to get your usual burrito order, but loaded with a bunch of bacon. Don't screw this up, Orange County.